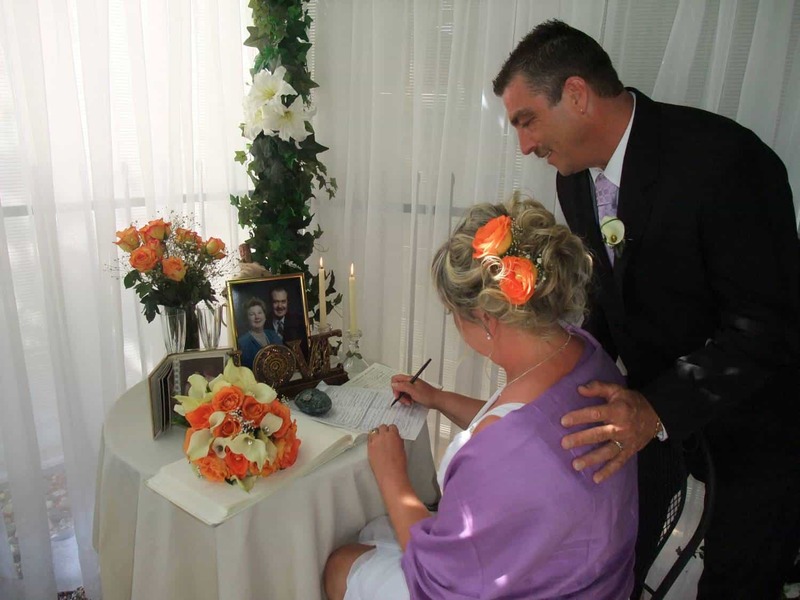 A Vista Villa loves coordinating weddings and it shows! 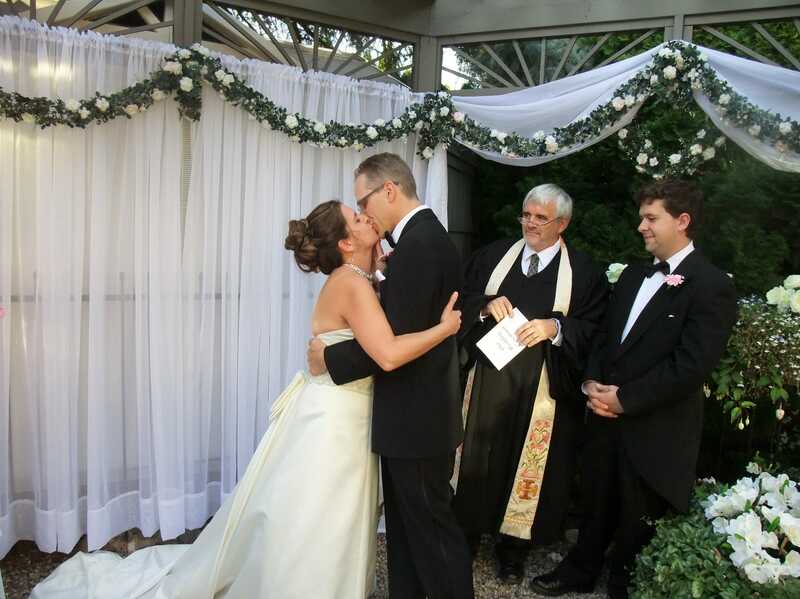 Our top priority is to ensure our brides and grooms experience a completely stress free day of their dreams. 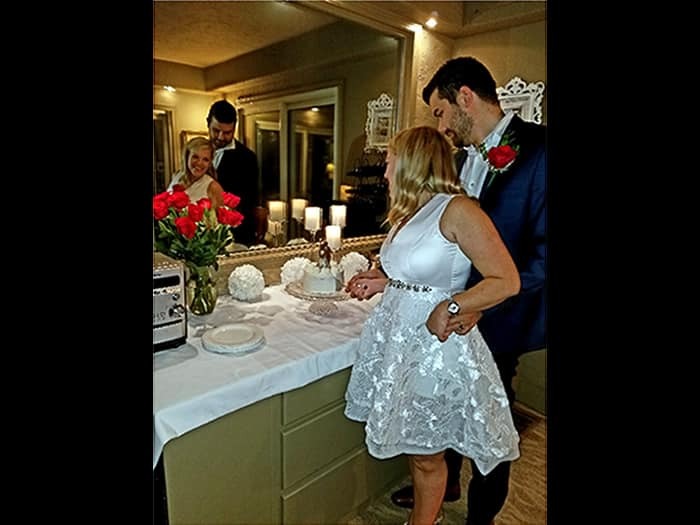 Three carefully designed ceremony packages include a variety of honeymoon options in luxuriously private Jacuzzi suite accommodations as well. I must say that our expectations were not only met, but far exceeded! The gourmet dinner was absolutely incredible! The choice of wine and champagne were amazing! Thank you for making our wedding the most lovely, beautiful and memorable experience ever. Many loves and thanks. 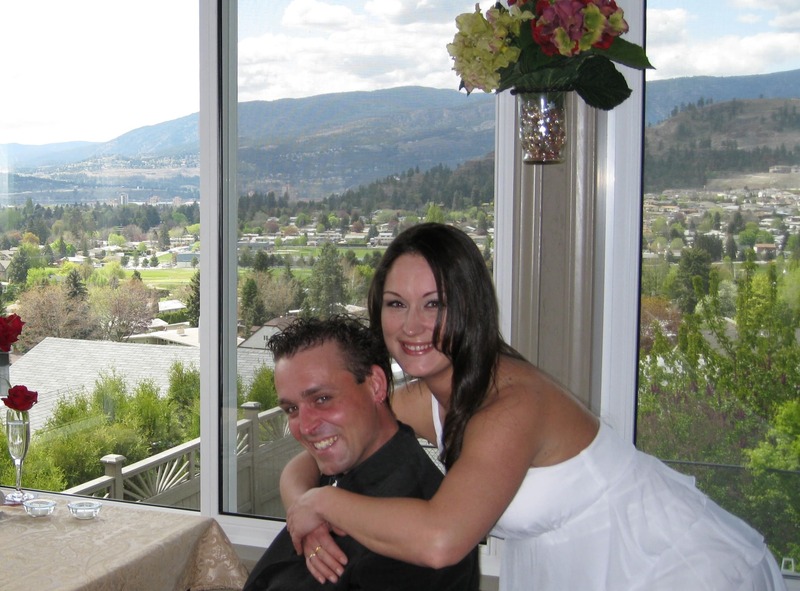 John & Vicky, Kelowna, B.C. Thank you for making our wedding so very special. We had an amazing time. Food, service and scenery was beautiful. Memories made for a lifetime. All the best! 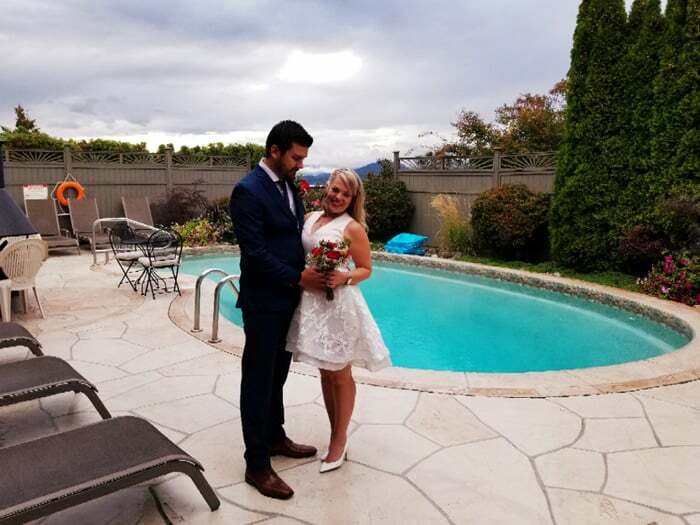 Ramin & Amber, West Kelowna, B.C. Thank you from the bottom of our hearts! You made our very special Elopement so memorable. From your recommendations for the photographer (Kim Elsasser), our Marriage Commissioner (Donna Rubadeau) and Raj (my Make-up Wizard). Everyone was wonderful! The food was marvelous and the attention to every romantic detail amazing! You are amazing! And not least thank you for witnessing our marriage. We are over the moon. Thank you! Sheilagh & Andrew, Kelowna, B.C. I cannot thank you enough for what an amazing job you did on such short notice!!! It was everything we could have asked for and much more. Thank you for all your help and patience!! The decor was wonderful and the meal was simply amazing!! We will definitely be recommending A Vista Villa to everyone. Once again, thank you so much for all you have done for us! Thank you so very much for putting on such a beautiful ceremony for us! Our evening wedding was absolutely stunning and the entire evening flowed wonderfully. 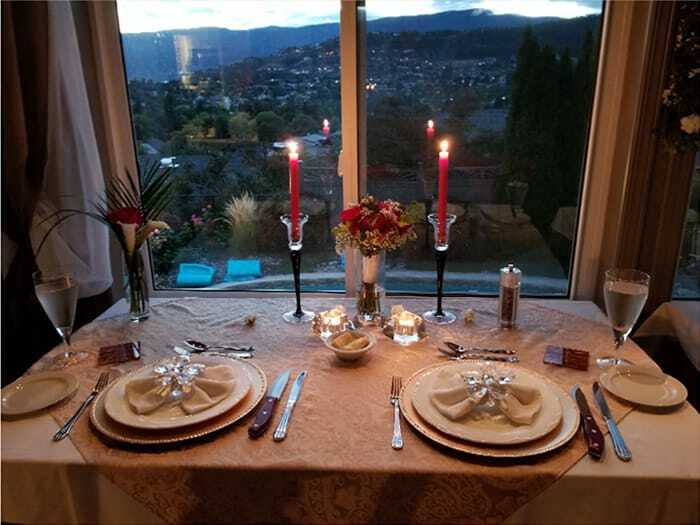 Your place is so very beautiful, the food was just fabulous and our wedding night was so romantic! We will be bragging about A Vista Villa to our friends for years to come! PS. The candles and jet tub were awesome!! Thank you so much for making a perfect wedding happen! It couldn’t have been better. After being together 10 years you helped bring romance back into our lives. Great food, great wine and most of all great company. Thank you again for a wonderful 3 days. I will cherish this whole experience forever. You have our vote for the “Miss Pamper 2010” title! Thanks again for the wonderful place to enjoy our wedding. 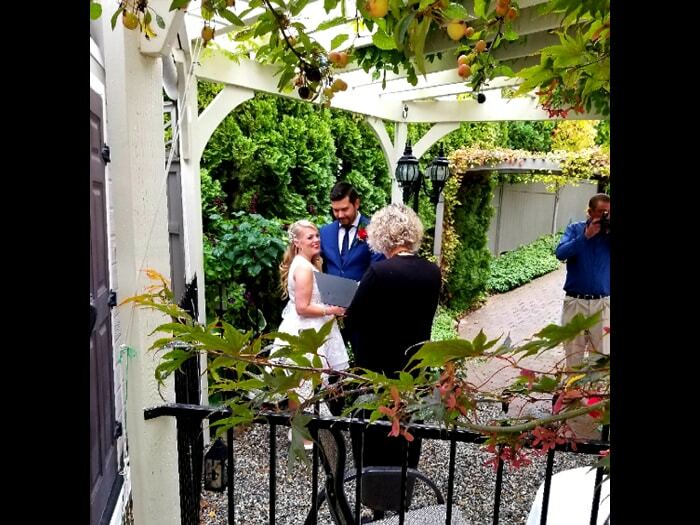 The grounds were lovely and you ensured that the ceremony was thoughtful and delightful for everyone! We all loved our suites and couldn’t be happier! We look forward to returning on an anniversary for sure! Thank you Sherry for making our wedding so very special and memorable. You really are the hostess with the mostess! We had a wonderful time & haven’t relaxed this much in forever. Thank you for giving us this wonderful time we got to spend together. We hope to see you again, love MR. & MRS. Thank you doesn’t say enough! 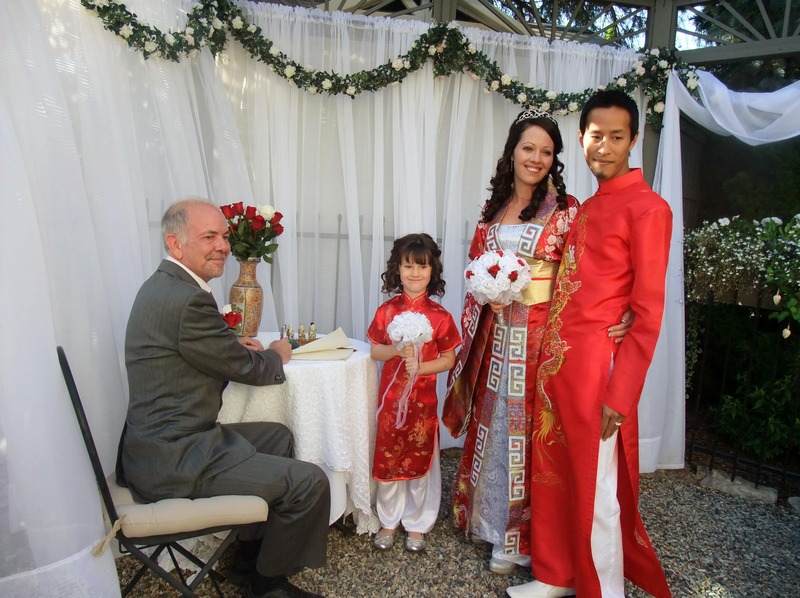 When we decided to elope, we never thought that it would be beyond our dreams, on our special day. You both went above and beyond. We both felt very relaxed and at home here at the Villa. Thanks again to you both for a special day that will never be forgotten. Also thank you to your staff, we appreciate all they have done for us. Thank you for putting the “wow” factor into everything. You made our wedding day something we will always remember. The photography work was terrific, we can’t thank you enough for everything you did for us. The food was excellent, the room awesome and the service incredible. We’ll be back. Our wedding here was fabulous. We had hopes and expectations … and you exceeded them. You are very special people and it is a very special thing that you do. Thank you for everything that you did for us, especially the little details. The things you do set A Vista Villa apart from the rest. Best wishes to you and thank you for the very memorable start to our new lives! Very relaxing and well done! Our hostess took care of everything on our wedding day! We just had to show up with our wedding rings an wedding clothes! 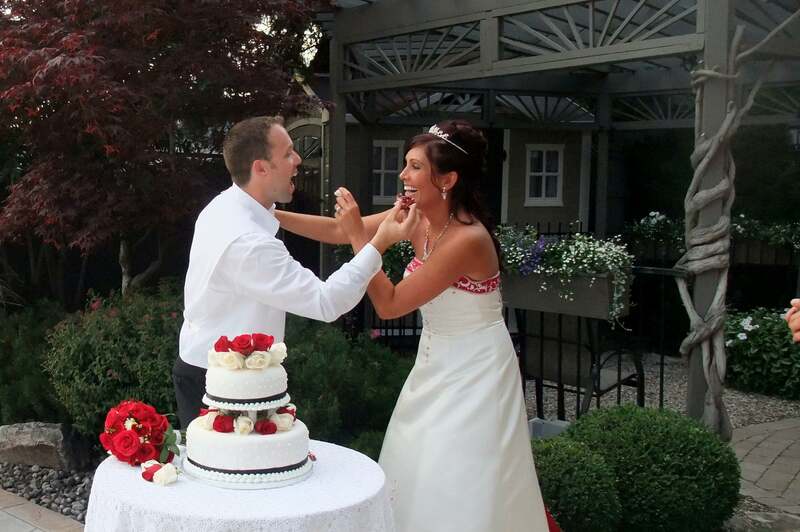 Our food was delicious, plus our wedding cake was great – it was a mango cake, so so good. The room we stayed in was beautiful and the night of the wedding was turned in a romantic suite. The bubble bath waiting and rose petals everywhere, so pretty! The hostess allowed me to feel like a Princess for one day and she made my wedding day way more beautiful than I thought it would be. So happy we are! 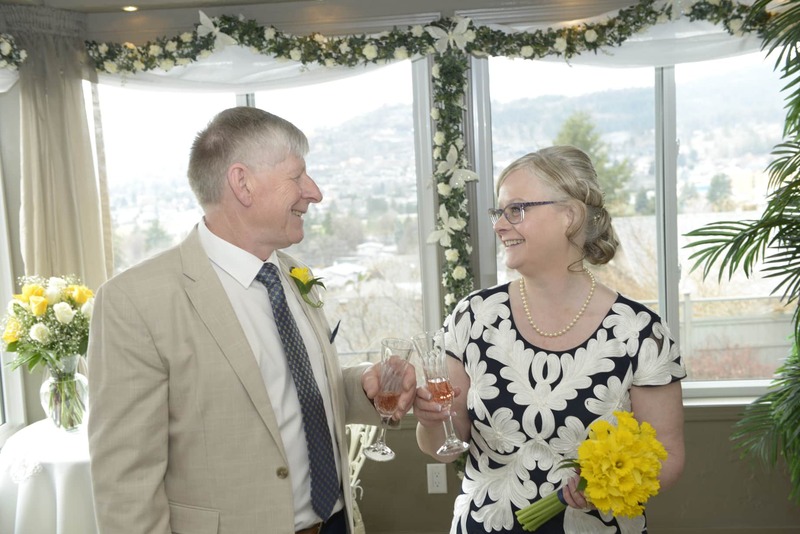 Paul & Lindy, Terrace, B.C. Thank you for the great memories and intimate wedding. The spot was perfect. Can’t wait to come back to your cozy little corner of Kelowna! Thank you for everything! Cait & Kurt, Pitt Meadows, B.C. Thank you so much for helping me put together a very memorable mini-wedding in 5 days time. My parents, daughter and new husband were delighted and surprised!! I am so happy I called you. Thank you for a beautiful day! Everything was first class! Thank you for such a beautiful ceremony. Could not be happier with the place. Great food, great people! Thank you for your attention to detail. Your rooms are beautiful we had an amazing time. See you in a year for our first anniversary all the best to you! If we had to use one word to describe our experience at A Vista Villa it would be “PERFECT” or perhaps ‘WOW”. Every detail was covered, our wedding was perfect! You thought of everything & then some! Pictures do not do this view justice, you must see it! Thanks for being a big part of the first day of the rest of our lives! Thank you for the beautiful wedding ceremony! It was everything we both dreamed of. The dinner was fabulous, you are a great cook and hostess. 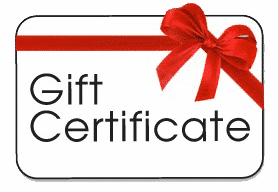 We will be telling all of our friends and family about our stay at A Vista Villa. We had such a wonderful time. You made our day much more wonderful with such great hospitality and exceptional food. We will come back definitely in the future. The room was beautiful & we appreciate everything that you have done for us. I wouldn’t have wanted our special day celebrated anywhere else. Thank you so much! Thank you so much for being there for us on our special day. All the touches made for an unforgettable occasion. Everything from the ceremony, to the pictures & candlelight dinner with a full moon over clear skies was just perfect! What a wonderful stay! Thank you so much for helping to make our wedding day such a beautiful & joyous occasion. The room was gorgeous and we couldn’t have asked for a better experience. Thank you! Thank you so much for the wonderful evening for Tony and I. Thank you again for welcoming our little Samuel – the first baby at the Villa – our weekend was perfect! Where to even begin. I cannot even thank you enough for making our wedding so special. You really made it happen for us!! From the moment we got here we felt relaxed and comfortable in our surroundings. You have a spectacular place with amazing food and drink and you truly tie it all together with your fantastic service. Thank you! Thank you! Thank you! The whole day was amazing. You looked after every need from start to finish. Food was amazing! Thank you so much for making our special day the most perfect day of our lives!! Hope to see you again. Maybe Anniversary!!! Lots of hugs.